Seamus Moore Song Lyrics. Mostly funny country Irish songs from The J.C.B. man. Some of the songs have guitar chords. Seamus Moore is regarded as one of Ireland's finest writers of humorous songs, if not the best. Seamus has written songs about most aspects of Irish life giving the songs a funny twist. 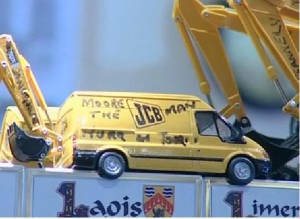 He continues to tour around Ireland as The J.C.B. Man wearing his now famous yellow builders vest. It's a welcome break to have these funny songs, with all the doom and gloom of every day life and the bad news every time you open a newspaper or turn on the t.v. While writing out these songs by Seamus I get more convinced that he didn't make them all up, I'm sure some of the stories set out in the songs are true. You just couldn't make this stuff up. As I said some have the guitar chords and the others, well I'm working on them and getting a bit of help from regular visiters to the site who give a dig out when they can, so check back now and then and I may just have them worked out. Folk Or Country Irish ? Are these song by Seamus country music or folk songs ? , well I'd call them country, that's because they have a country music beat to them, they could well be folk songs if the timing was changed. They tell a good story and that's what all folk songs should do, when you go about writing a song and you compleat the lyrics and start to put the tune to them you have to decide if it's going to be a country folk or even a pop song. Seamus put a country beat to them so that's what they became.